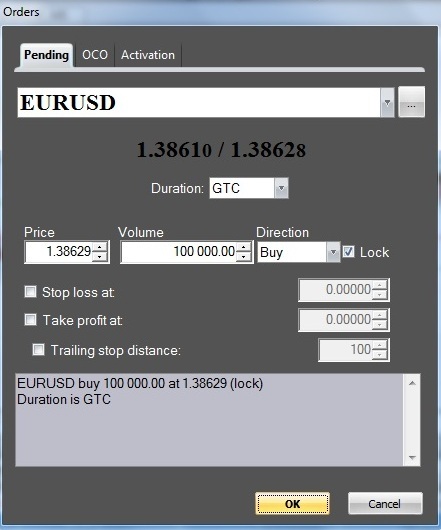 If you want to open a position at a price different from the current market price, you need to set a Pending order - an order to automatically open positions when the market reaches the preset price. Select "Trade" from the main menu and click on "Order". Right-click on "Market watch" window and choose "Order" function from the context menu. Right-click on the "Chart" of the financial instrument and select "Order" from the context menu. 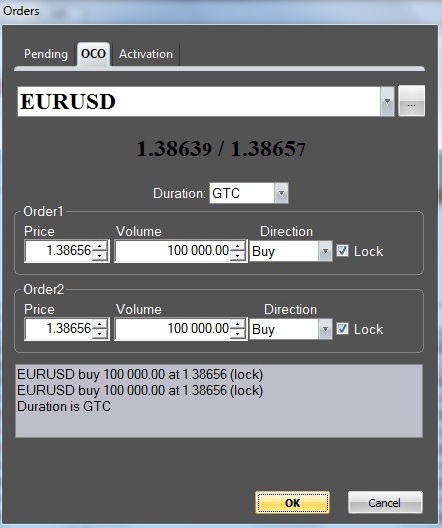 In the "Open positions", "Sum open positions" and "Orders" windows right-click on the position (order) of the financial instrument you prefer and select "Order" from the opened context menu. 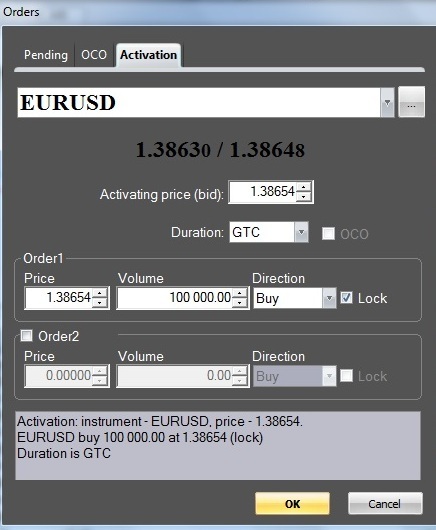 In the opened "Orders" pop-up window you will be offered to choose the order parameters. To choose the order type, click on the corresponding tab. А Pending order opens a trading position when the market reaches the price, set by you. In case of an OCO you have two orders and in case of execution of one of them, the other one is cancelled automatically. The Activation order is a pending order that is set when the price reaches the level of activation. The set order will appear in the "Orders" tab. To delete an order in the "Orders" tab right-click on the preferred one and choose "Delete" option from the context menu. To modify an order in the "Orders" tab right-click on the preferred order and choose "Edit" option from the opened context menu. The "Orders" pop-up window will open, where you can change any parameters of the order.